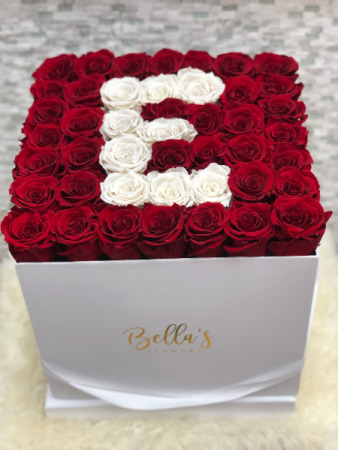 49 plus Eternal red roses with 1 initial in a 12x12 white square hat box. These roses are preserved and last up to 365 days. NO water needed. 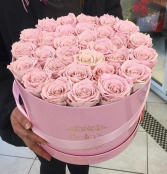 The original “roses that last a year”, this gorgeous collection of the most exquisite roses is the perfect gift for a loved one or a special occasion. 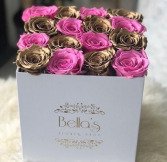 Housed in a box, these roses are a beautiful statement piece that add beauty wherever they are placed! 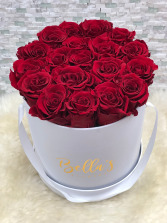 18 preserved roses are included in a white hat box. No water needed! Complimentary personalized message written on our customized stationery.